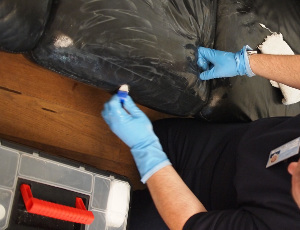 Our expert cleaners will do a thorough examination of the type of upholstery as well as its condition. First the cleaner will hoover and pre-treat all stains with the proper detergents. The actual deep cleaning is either steam or dry cleaning, depending on the type of upholstery. Dry cleaning is good for velvet, silk, suede and other delicate materials. Leather sofa cleaning is performed with special foam leather cleaner followed by a leather conditioner. You can also order deodorising and special stain protection. We can remove stains from wine, paint, vomit, rust, blood, tea, coffee and others. To ensure that your sofa looks as good as new and is free of allergens, dust and dirt, book our expert sofa cleaning service. Besides cleaning your sofa, our cleaners can provide you with expert mattress cleaning and bed bug treatment. It removes and destroys bacteria, dust mites and fungal spores from your mattresses and pillows. The dust, dirt and dust mites stored on and inside your pillows and mattresses can trigger dust allergies, asthma, runny nose, itchy red eyes, headaches, eczema. Our cleaners can offer you dry or steam mattress cleaning. We can also use a special UV light treatment, which kills all germs and mites, and remove allergens from the mattress. It is a quick and efficient procedure that requires no moisture and no drying. It is good or hospitals, hotels, hostels and homes. Excellent Carpet Cleaning began providing the businesses and homes in City of London EC with high quality deep sofa and upholstery cleaning services back in 2005. We use state of the art professional cleaning machines and the safest cleaning solutions. Our cleaners will clean any kind of sofa and upholstery. In addition to that, you can book professional bed bug treatment, blinds cleaning, deep mattress cleaning, drapery cleaning or curtain cleaning. You will receive a discount if you combine several of our services. Booking requires one simple step - contacting our 24/7 customer care service. Either call 020 3404 0500 or use the online form to make a sofa cleaning booking. You pay when the cleaning service has been completed, so there are no deposits. Our prices are fixed and include insurance of the sofa cleaning service as well as stain removal. Local landlords, agencies, regular customers and those who book early get a discount.